Hard as it may seem, it had felt as if I had not thrown myself into the kitchen for a while. So at some quiet moment on Friday, between breakfast and after work beers (of which there were lots) I sat down with orange post-it notes and pen in hand and decided on cooking/baking that I was willing to embark upon this weekend. The following recipes are neither of them difficult nor tedious – they just require some waiting around. This is why they are ideal weekend activities. During the week I wouldn’t want to wait 45 mins for something between creation and consumption. 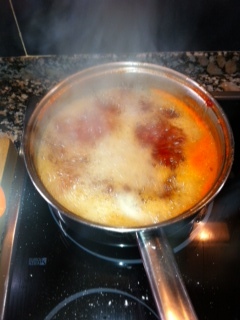 I have put the recipe on a previous post but here are some photos taken during the production of this batch. 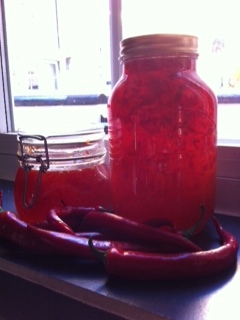 You have got to take my word for it, please believe me; red flecked and fiery this chilli jam is addictive. It makes for complsive eating as you convince yourself that you need that extra chunk of cheese or slice of cold meat drizzled with sweet chilli. 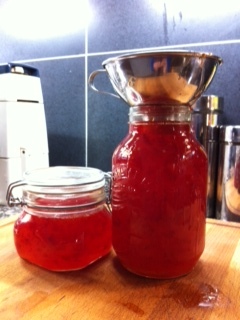 It is so easy to make it is a shame not more people try it. All I really need to do here is buy smaller Killner jars and hand out to friends and family, as 1500mls of chilli jam is clearly too much for me. Any takers? I use a very basic bread recipe taken from Jamie Oliver which I have jiggled slightly. 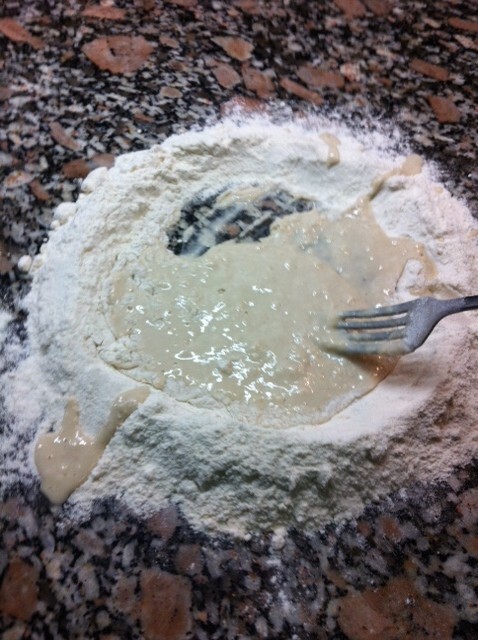 2nd: Once the flour has absorbed the liquid I start using my hands to bring the mixture together. At this moment I start kneading the dough. Kneading: This is the process whereby you use the heel of your hand to push the dough away from you, fold the dough over, rotate and repeat until the dough becomes elastic and smooth. 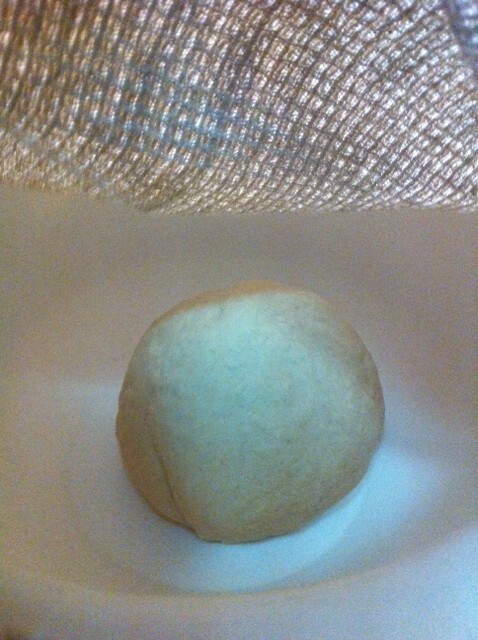 3rd: I then place this dough ball into a bowl and cover with a tea-cloth to prove. It is this proving that makes the dough rise and fill up with pockets of carbon dioxide gas making for a light and fluffy dough. After ~45 mins I knock the dough back and start rolling out and assembling my pizza. I make this pizza so often that I don’t weigh the ingredients. Everything is by eye. My two rules are: how big a pizza am I going to able to consume and how big my oven is! If with every push of the heel of my hand I feel the dough is dry and flaky I wet my hands in tepid water and continue. If alternatively it is too moist and not taking the force I add more flour. Once the dough becomes as warm as flesh, it is ready to rest in a warm place to allow the yeast to work its magic. Fresh parmesan grated over and topped with rocket leaves. Drizzled with olive oil and tobasco sauce at the ready. I always eat my pizza off the board. Nice pizza! 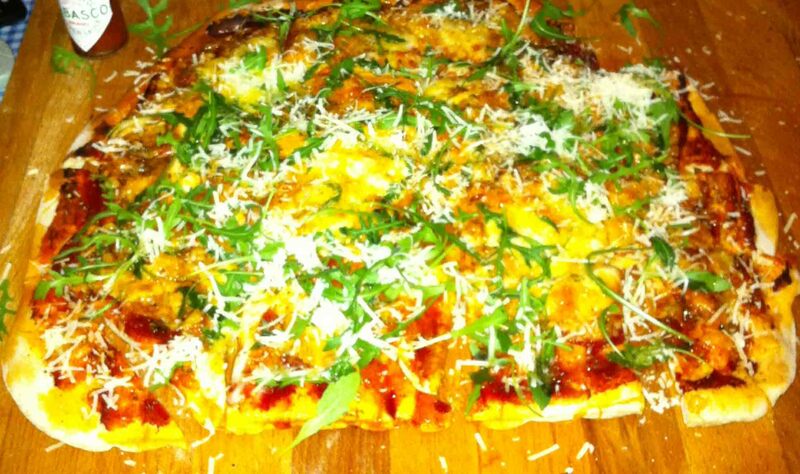 We have been noshing on home made pizza lately – so much fun to concoct your own! Love the rocket on top – had that recently in Prague and it reminded me of how much I loved that zap of freshness on the ‘za! I see more pizza dough in my very near future!!!! How long to lunch!!!?? ?